Ohio State research turns a terminal cancer into a manageable illness. 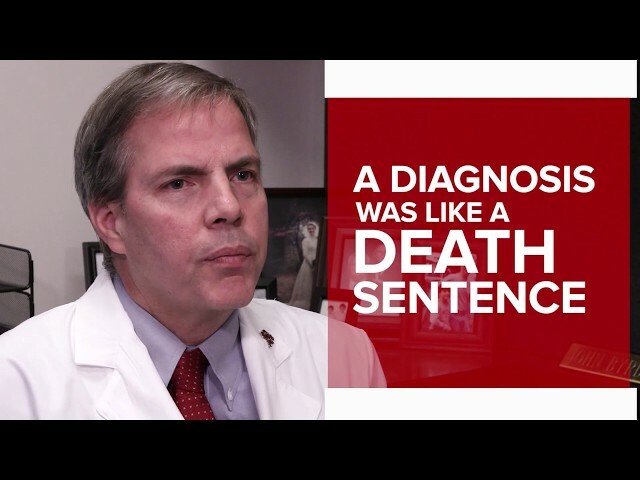 When John Byrd, MD, first began research in 1991 into treatments for chronic lymphocytic leukemia, a CLL diagnosis was like a death sentence. "There was a chemotherapy drug then that could treat CLL, but patients' immune systems were obliterated," says Byrd, a cancer researcher at The Ohio State University Comprehensive Cancer Center – Arthur G. James Cancer Hospital and Richard J. Solove Research Institute. "One of my patients at the time died not from CLL, but from pneumonia. I remember looking at his X-ray and thinking, 'We have to do better than this.'" By 1996, Byrd's team had begun its first preclinical trials focused on prolonging CLL patients' survival with targeted therapy, which differs from chemotherapy by going after cancer cells without attacking the entire body. Just nine years later, the Ohio State researchers published evidence of the first-ever treatment to prolong survival in patients with CLL, combining a newer, immune-based drug called rituximab with chemotherapy. But the researchers wanted to do better. They continued the hunt for a targeted therapy that could be effective on its own. "Everyone said this couldn't be done with CLL because the disease didn't have a common genetic mutation to target," Byrd says. That was until his research team concentrated on an enzyme in CLL tumor cells that allowed cancer cells to multiply and create havoc. The enzyme could be blocked by the drug ibrutinib. The first ibrutinib studies worked "phenomenally," Byrd says. "Of the study's patients in 2010, virtually all had no treatment options remaining, but their bodies responded to ibrutinib." The results were so dramatic that the FDA approved ibrutinib for CLL patients by 2014. Support by Pelotonia provided many patients early access to the drug at Ohio State. The researchers had also hoped to identify a way for patients to live with CLL just as others manage diabetes or high blood pressure. That meant avoiding chemotherapy, which comes with serious side effects. "After seeing ibrutinib's success, we decided our new goal with these studies was to be able to remove chemotherapy from treatment plans for CLL," Byrd says. In 2017, Ohio State researchers released data showing that a second generation of ibrutinib called acalabrutinib provided an option for patients who could not tolerate ibrutinib. It's now being tested to see if it's a better CLL treatment than ibrutinib overall. The team's biggest breakthrough yet was announced in December. Results from a trial led by Jennifer Woyach, MD, an associate professor who trained under Byrd, showed that ibrutinib slowed the progression of CLL in older patients much better than the regimen previously considered most effective—the combination of rituximab and chemotherapy. "This was significant," Byrd says. "Except for an extremely small population of patients, we're done using chemotherapy for CLL." Before these innovative breakthroughs, the conversations doctors everywhere had with CLL patients were about how their lives would be shortened. "Now, I get to tell patients they're going to be survivors," Byrd says. "They leave my office happy. And it's amazing to see the wonderful things people do when given a second chance at life." Ohio State's commitment to pioneering life-altering biomedical discoveries has led to new treatment advancements not just at the Wexner Medical Center, but also in our partner facilities across Ohio and in hospitals worldwide.